In law school, my friends and I used to have this guess-the-movie game using famous lines. One such line was, “Frankly, my dear, I don't give a damn.” Not having read the classic book from which it was lifted, I had no clue then that it was a line by Rhett Butler from the movie adaptation of the novel, Gone With The Wind by Margaret Mitchell. 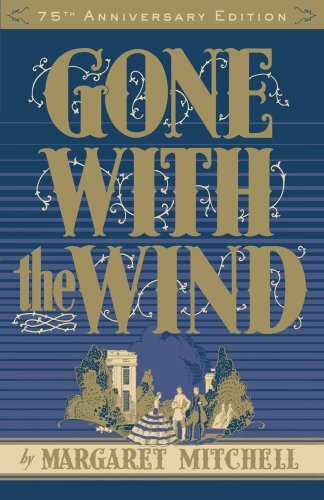 I was to learn later that Gone With The Wind has been touted to be “one of the most romantic novels of all time”, and that it's one of those bucket-list books that you can't not read. Having just concluded reading this with my book club friend Angus, I now know that, except for the “frankly” in the beginning of the line, “Frankly, my dear, I don't give a damn” were Rhett Butler's exact words to Scarlett O'Hara, the coquettish heroine and love of his life, in one heart-rending scene nearing the end of the book. Gone With The Wind is one of the longest novels I've ever read. I have the Kindle edition so I couldn't really appreciate how thick it must be in print, but when you're using an e-reader and you've made several presses on the “next page” button, and yet you keep seeing “1%” at the bottom of the screen for the next 20 presses, you know that you're in for the long haul. This Pulitzer-winning classic novel takes place in the late 1900s, in the heat of the American Civil War in Georgia, Virginia, and the neighboring states. Although it has been declared to be “one of the greatest romance novels of all time”, I thought it had more historical fiction in it, and the romantic aspect was a mere side story. Rhett Butler, a rogue and (accused) Scallawag who seemingly had no past, and Scarlett O'Hara, a spoiled brat and eldest daughter of an Irish plantation owner and a true-blue Southern belle, star in the romantic side of the story. Of course, the road to happily ever after (or wherever it is they're headed) is a long and winding one, and not without obstacles to hurdle. There are love triangles, jealousies, intrigue, betrayals, tragedies, and (Scarlett's) immaturity. With the war as backdrop, the novel also tackled political and social issues expertly weaved into the storyline. But, of course, the more interesting parts for me were the exchanges – often heated – between Rhett and Scarlett. Honestly, during the first half of the book, I was sorely tempted to chuck it – all the talk about the war was boring, and I loathed Scarlett O'Hara because she represented everything that, in my opinion, is wrong in a person: selfish, bratty, shallow, manipulative, stupid, and coquettish to top it all off. She cared about nothing and no one but the satisfaction of her own selfish wants and desires, and will stop at nothing to get it – even trampling upon the feelings of honest people. Yes, she's beautiful and charming (though not smart), and she knows it, and she uses it to her advantage. Because of this depiction, I got so agitated reading the book; thankfully, I was buddy-reading this with Angus, and I just knew that I had to finish it. On the other hand, Rhett Butler, despite his roguish and seemingly unscrupulous ways, was someone you could admire. He tormented Scarlett endlessly, but it was clear from the start that he was very smitten and, later, had truly fallen in love with her. I consider Rhett's love for Scarlett to be the purest kind, because he loved her despite the knowledge of all that she was and what she was capable of. And, believe me, Scarlett was a force to be reckoned with. However, my favorite character in the book is neither Rhett nor Scarlett, although I truly loved the wit and sarcasm of the former. Melanie Wilkes, Scarlett's sister-in-law and wife to Ashley, Scarlett's “teenage dream” of a guy, was the epitome of everything that I admire and wish I could be. She was honest and trusting, but not to the point of being naïve, fiercely loyal to her family and friends, a faithful wife and friend, and headstrong despite her physical shortcomings. Within the community to which she and Scarlett belonged, she was the most respected woman whose opinion carried great weight, and was thus considered to be the heart of their small group. She understood people, she carried no grudges, she paid her dues, and until the very end, she cared for everyone. How can she not be my favorite character? Reading Gone With The Wind has been likewise very informative, especially with respect to the American Civil War and some racial issues – it was around this time when negroes were still slaves and considered property of the household which they served. I encountered the words “Scallawag” and “Carpetbagger” for the first time, terms which were connected with the American Civil War. There was a mention of the racist group Ku Klux Klan, as well. To sum it up, I enjoyed reading Gone With The Wind, albeit only after hurdling the first half of the book. And since it's a romance novel, I pictured a specific ending in mind, but what I read completely surprised me, though that's not to say that I didn't like it. In fact, I liked it very much, especially when I got to the part when Rhett Butler uttered, "My dear, I don't give a damn." For that, the one and a half months that I read the novel was worthwhile.